The kayak moves through the clear blue water with ease. I feel the water from Rafael’s oar dripping on my back and it feels great on my hot skin. The sun is shining, the water is calm and Gilligan’s Island grows bigger every second as we close in. I look to my left and see Rachel with her two cousins paddling as fast as they can. With their erratic steering, they’ll be lucky to make it to the island at all! 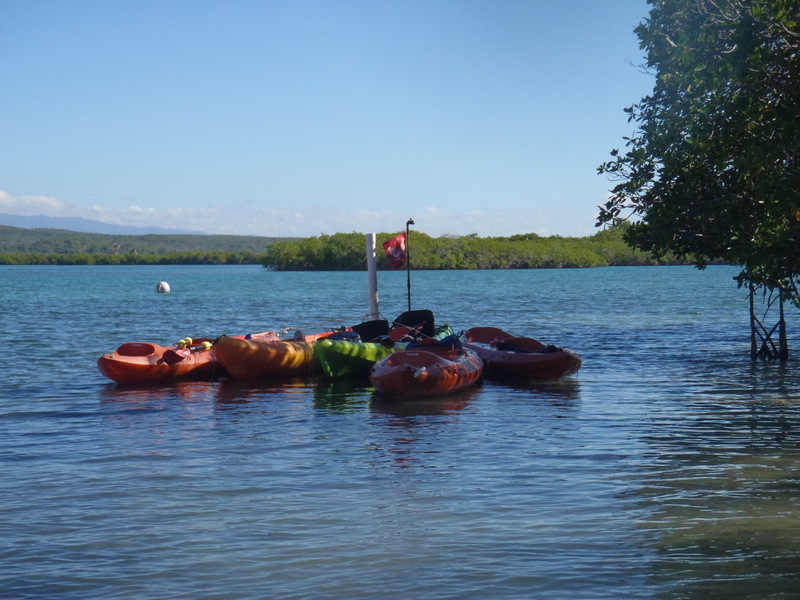 Our group of four kayaks pulls up to a small beach in the mangrove forest that is Gilligan’s (spelled Guilligan’s by locals to get the hard G sound) Island. The Island is actually divided into a few pieces of land separated by narrow canals. We go to the one that is closest to the mainland, which is not the one where the ferry boat takes passengers. Being on the smaller island gives us more privacy and quiet, as the crowds tend to stay where the ferry drops them. While the others unload the coolers and bags, Rafael and I take our kayak out exploring. The narrow canals have an amazing current. Later, we all go and snorkel through them. When we get tired of swimming, we hold onto the mangrove roots. If we let go, we are pushed back the way we came. It’s a great workout! One canal we swim against the current, but coming back through the other one is a breeze as we are pulled back to the start. 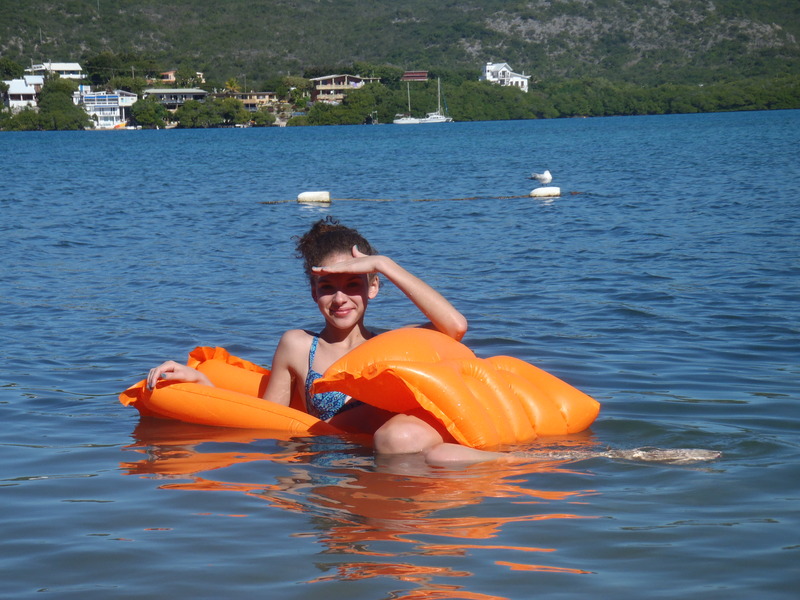 After our swim, we relax on inner tubes in the water while some of the others kayak to an island in the distance. We drink our beers and relax in the sun before we all picnic on the sand. 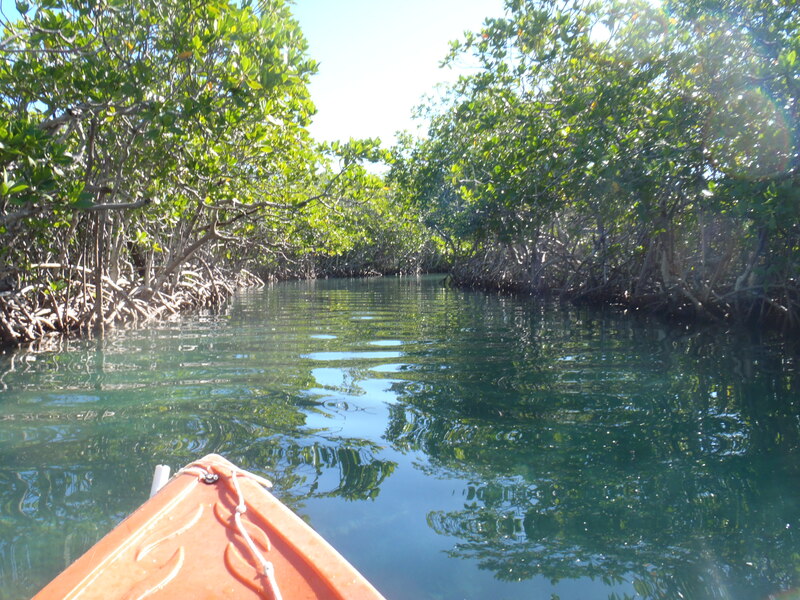 Gilligan’s Island is a great place to relax, explore and get away from it all. Can I do this adventure? Courage Level: 1 This is an easy day. Kayaking, lying in the sun, snorkeling and munching on goodies is a wonderful way to spend a day. 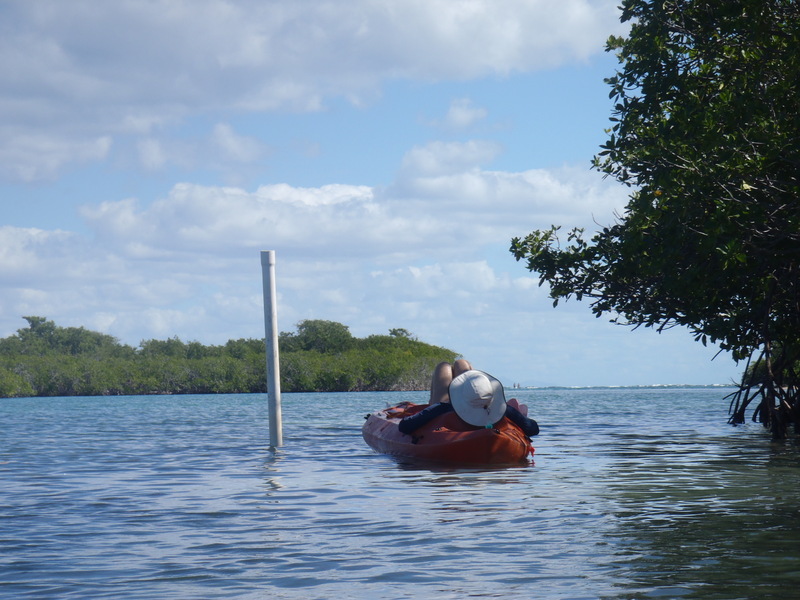 Fitness Level: 2 Gilligan’s Island is only about 10 to 15 minutes by kayak to the mainland. You can take your time, go at your own pace. There are no facilities except an outhouse on the bigger island (which you want to avoid if at all possible!) You must bring water at least. We have a fabric collapsible cooler that can be packed into a suitcase. We use it every time we are at a beach away. Also, make sure you have lots of sunscreen, maybe a hat and sun shirt and some bug spray, just in case. We had some inner tubes that you can buy at home and pack. Without air in them, they are tiny! They make the day more relaxing since there is not a lot of room to spread out on the island. If you have snorkels and masks, bring them. We didn’t see a lot of colorful fish, but it makes it easier to swim around the island. We rented our kayaks from Gilligan’s View Apartments. They do not list anything about it on their web site, but call them. They have kayaks, even one that fits 3 people. We paid $20 per adult and $10 per child to rent them for the whole day. They don’t take credit cards and won’t guarantee the kayaks will be there if you get there late. Go early. We arrived by 8:30 am and we called them on our way to reassure them that we were coming. To get there from San Juan, you will take Route 52 over the mountains and through Ponce. After Ponce, it will turn into Route 2 West. Continue to Guanica and take the exit for 116R. As you near the town of Guanica, you will take a left onto Route 333. This is a small, beautiful winding road. Gilligan’s View Apartment will be on your right, number 27. You will pass the place where the ferry takes people to the Island. Plan on about 2 hours to get there from San Juan. My advice: DO NOT GO TO THE ISLAND IN THE SUMMER! It is very popular with locals and will be mobbed with people. Avoid weekends as well, if you can. If you don’t want to kayak and want to take the ferry (for about $7 per person,) wade over to the smaller island when you get dropped off. It’s much better than being stuck with everyone else.